Was Uncle Sam a Real Person? Uncle Sam is known to everyone as a mythical character symbolizing the United States. But was he based on a real person? Most people would be surprised to learn that Uncle Sam was indeed based on a New York State businessman, Sam Wilson. His nickname, Uncle Sam, became associated with the U.S. government in a joking manner during the War of 1812. According to the 1877 edition of the Dictionary of Americanisms, a reference book by John Russell Bartlett, the story of Uncle Sam began at a meat provisioning company not long after the beginning of the War of 1812. Two brothers, Ebenezer and Samuel Wilson, ran the company, which employed a number of workers. A contractor named Elbert Anderson was purchasing meat provisions intended for the U.S. Army, and the workers marked the barrels of beef with the letters "E.A. - U.S."
Supposedly a visitor to the plant asked a worker what the inscriptions meant on the cask. As a joke the worker said "U.S." stood for Uncle Sam, which happened to be the nickname of Sam Wilson. The joking reference that provisions for the government came from Uncle Sam began to circulate. Before long soldiers in the Army heard the joke and began to say their food came from Uncle Sam. And printed references to Uncle Sam followed. The usage of Uncle Sam seems to have spread quickly during the War of 1812. And in New England, where the war was not popular, the references were often of a somewhat derogatory nature. Now Mr. Editor — pray if you can inform me, what single solitary good thing will, or can acrue to (Uncle Sam) the U.S. for all the expense, marching, and countermarching, pain, sickness, death, etc., among us? "The Patriotic Militia of this State, now stationed here to guard the public stores, are daily deserting 20 and 30 a day, and last evening from 100 to 200 made their escape. The say U.S. or Uncle Sam as they call it, does not pay them punctually, and that they have not forgotten the sufferings of cold toes last fall." In 1814 many references to Uncle Sam appeared in American newspapers, and it seemed that the phrase had changed somewhat to be less derogatory. For instance, a mention in The Mercury of New Bedford, Massachusetts, referred to a "detachment of 260 of Uncle Sam's troops" being sent to fight in Maryland. Following the War of 1812, mentions of Uncle Sam in newspapers continued to appear, often in the context of some government business being conducted. In 1839, a future American hero, Ulysses S. Grant, picked up a related enduring nickname while a cadet at West Point when his classmates noted that his initials, U.S., also stood for Uncle Sam. During his years in the Army Grant was often known as "Sam." The character of Uncle Sam was not the first mythical character to represent the United States. In the early years of the republic, the country was often depicted in political cartoons and patriotic illustrations as "Brother Jonathan." The Brother Jonathan character was generally depicted as being dressed simply, in American homespun fabrics. He was usually presented as opposing "John Bull," the traditional symbol of Britain. 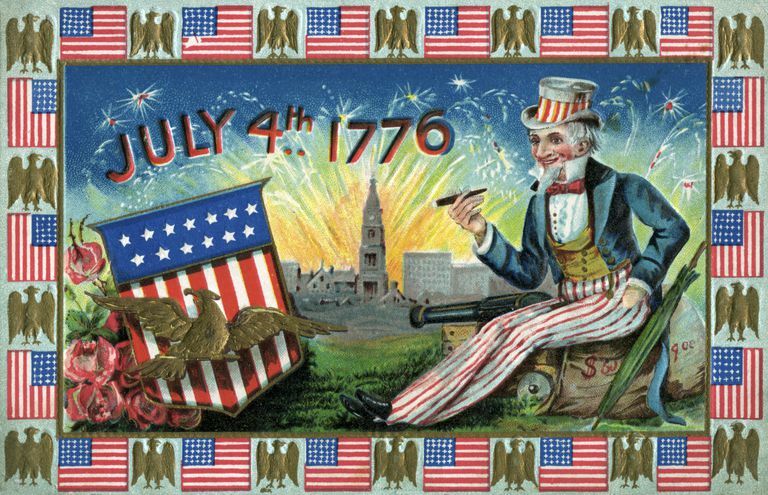 In the years before the Civil War, the Uncle Sam character was portrayed in political cartoons, but he had not yet become the visual character we know with the striped pants and star-spangled top hat. In a cartoon published before the election of 1860, Uncle Sam was depicted standing next to Abraham Lincoln, who was holding his trademark ax. And that version of Uncle Sam actually resembles the earlier Brother Jonathan character, as he is wearing old-fashioned knee breeches. The noted cartoonist Thomas Nast is credited with transforming Uncle Sam into the tall character with whiskers wearing a top hat. However, in cartoons Nast drew in the 1870s and 1880s Uncle Sam is often portrayed as a background figure. Other artists in the late 1800s continued to draw Uncle Sam and the character slowly evolved. During World War I the artist James Montgomery Flagg drew a version of Uncle Sam for a military recruiting poster. That version of the character has endured to the present day. Who Was the Real Creator of Batman? Is This a Real Mermaid Caught on Video?